To read the ful article on virtual worlds news just click the pic. One of the Top Ten social Networks, Hi5 acquired a company named Pixverse a few month ago. Pixverse provides a 2D chat widget with enabled photo-sharing and video-sharing. 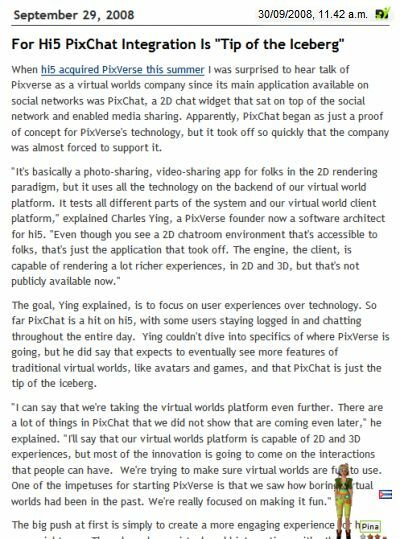 Charles Ying, one of the PixVerse founders and now a software architect for Hi5 gives an outlook on the further development of Hi5´s social network Chat: "The engine, the client, is capable of rendering a lot richer experiences, in 2D and 3D, but that's not publicly available now." He explained furtheron, that more features of traditional virtual worlds, like avatars and games might appear in PixChat. Like other social networks developing their communication features such as instant messenger applicacions, Hi5 seems to think at least one step ahead. Ying expects social networks and virtual worlds converge.